One of my favorite local farms offers a fantastic bulk buying club. It is where I get my tomatoes from every year (if I choose not to u-pick), along with other great summer items throughout the season. I recently picked up 10 pounds of pickling cucumbers and a bunch of piccolo verde fino basil. I had never heard of this variety, and was intrigued by the offering. Hey, some people buy shoes, I buy obscure grocery items :). The leaves of this basil are very small – no larger than oregano leaves, but much finer. The stems are also quite fine – similar to very young cilantro, so I just blended everything together when I made pesto this evening. 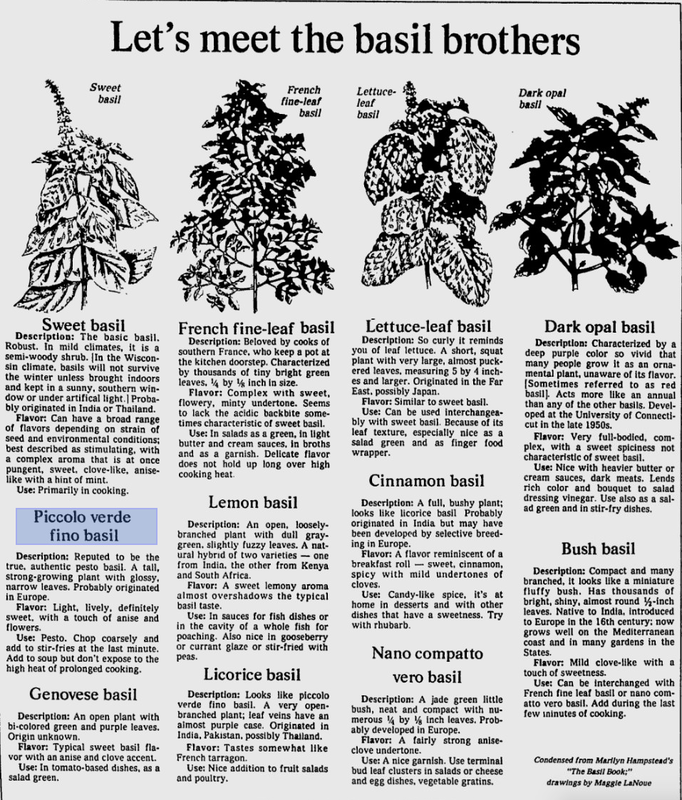 While researching online about this variety of basil, I came across this 1984 article from The Milwaukee Journal – according to this article, this variety of basil is the “true, authentic” basil for pesto. Tonight, I blended the basil with garlic, toasted cashews, nutritional yeast and sun dried tomatoes (San Marzano tomatoes from last summer – I’m almost out!). Some of it will go in the freezer for a quick dinner later, but the rest will be used tonight on pizza!